Do you work for Slack? Slack is your single workspace that connects you with the people and tools you work with everyday, no matter where you are or what you do. 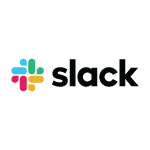 With Slack you get real-time messaging through calls and chat, a searchable record of all your files and conversations, and integrations with a growing number of handy bots and apps. Now everyone can finally be on the same page and get their work done. Slack: It’s where work happens. Learning about Slack? We can help. "Nice way to communicate with coworkers"
I like that I can type out a response to myself before I send it. I like that I can communicate privately with my coworkers about something before bringing it to the whole department. I like that I can tag or @ a specific coworker, so things can be said on a big channel but I know the person I really need to see something will. I wish I had more control over who was in the column to the left. Like something i need to know if my main people I talk to are online, but I have to first try to send a direct message before I can see. I also wish searching for older messages was easier, or that I could save conversations with helpful links in them. Right now when there is information I want to use later, I find myself copying the conversation and saving it to my notes app on my desktop. Its best for large groups of employees. I used it for another company that only have 5 employees, and it just didn't work as well with a small number of users. Email is better for a small group. The benefit with using slack over Gchat is that its a constant flow with all of my coworkers and collaborators. We can tag people in certain conversations, and have large group chats. "The work chat tool you needed all along." Slack helps you avoid wasting time in meetings and creates a ledger for team decisions. Before you use it and at first, Slack is tough to understand. It seems like it would be full of distractions if you can chat and send cat videos to colleagues during work. The true value is that instead of having to wait for manager X or legal counsel Y, you can get feedback almost anytime, anywhere, and decisions and working documents are shared in a digital space. This makes work so much more efficient. There's opportunities to improve the video chat tool. We still use Zoom because the Slack video call tool is choppy at times when Zoom isn't. Try it. The free version allows you to work with enough users where it's easy to implement and really beneficial for a team or small department, and implementation is very easy. People tend to have no trouble adopting it since it's so similar to personal chat programs. It's so much faster to make decisions with Slack. You can asynchronously get move-aheads, OKs, get feedback. "Great for any stage company! " I really like how easy it is to categorize the conversations with channels. You can easily separate commercial conversations, support conversations, finance conversations, etc. to easily search for relevant information on a topic. Also, the functionality of the phone app is great! Easy to use and syncs instantly with the desktop version so you'll never miss out! I'm not a huge fan of how you have to manually add people to the channels. I wish there was a way to say, every new person added needs to be added to these channels. Also, I wish there was a way to make a channel public, but private at the same time. For example, need to request access to view a channel, but treat it like an open channel. Use it! You won't regret it! I was hesitant at first, but the open channels allow for everyone in the company to contribute their knowledge. That will help the company be more transparent and maintain a culture that is welcoming. Slack has integrations to many different platforms (G-suite, CRM, etc), which will allow you to have a bunch of information in one space. My favorite integration so far is the integration with Zapier Bot. That has made my life so much easier ! The tools allow you to take internal communication wherever you go. With the connectivity of the desktop app and phone app, you never miss out on the important stuff! I love how easy it is to collaborate internally with slack. Slack is great for teams to work together smoothly without taking up time by going to an office to talk or have a meeting. It also is great for collaborating with remote employees. 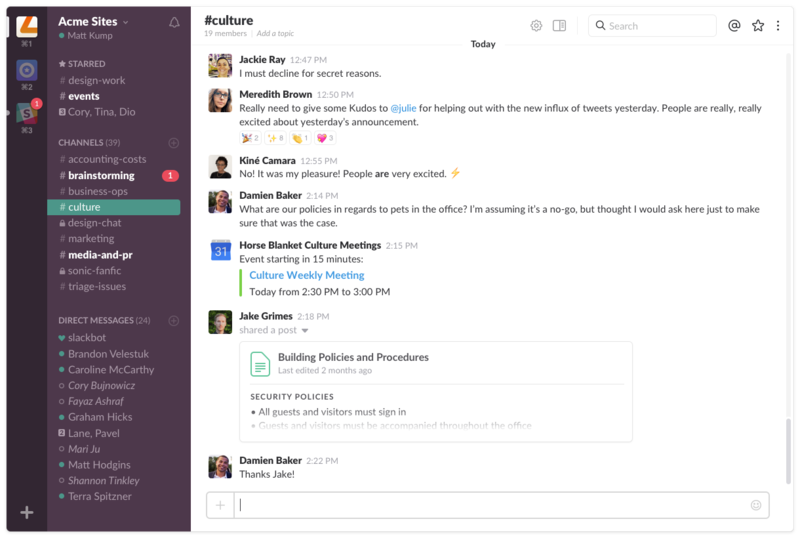 Slack allows you to create conversation and video chats in channels and organize by project, team, department, etc. It is quite difficult to link Slack though API to GitHub. Also, the desktop application does not bring much to the table compared to the web application. I think the best feature is definitely the way you can create as many channels and conversations as you want and still be able to filter them by topic. It is just so useful! Overall it's streamlined our communication within our department and has become a single place for a lot of information. Slack is a very versatile communication tool, allowing you to integrate lots of different apps to have one place for multiple actions, interactions, and workflows. "I like the ease of integrating many chat rooms in one place"
I love the speed of Slack. Once you've booted it up, it seems to fly. It doesn't matter how many rooms you're in or how many messages it has to recover. It's a breeze and a pleasure to go through it day to day. The platform is user-friendly, however, I feel like there are more ways and settings that I'm not really sure how they work like adding apps to the conversations and channels. This program is too cool, it has all the tools needed to collaborate and to send out daily updates to stakeholders. If you've lived through the '90s, as I have, you might remember IRC - Internet Relay Chat. A bunch of chatrooms online, talking to people or private messaging them. Slack is like that, but it claims to revolutionize the way we work or use email. I love using this platform online and the app on my phone to discuss with my team and follow up on their requests! I love using Slack to communicate with our team and receive their requests for their media and marketing needs. It's a great way to keep track and follow up on every project as well. "Internal Communications slacked by Slack 24/7/12/365"
The rate at which i can recommend Slack to a colleague or buddy suggests that I like it to the fullest. What I like most is the fact that Slack has a mobile app, which has intuitive interface and slick design. I like the way Slack has lots of features, such as activity and status. Integration with wide range of apps and APIs such as Salesforce and Dropbox Business is also a thing that I like too. I seldom come across obstacles while either sending files or collaborating with Slack. Hence, i have zero cons to be precise. I think all my friends and close colleagues have this app, but to those who don't have it, they should give it a try. I use Slack to forward expense reports to the president of our company. Slack allows me to save time while communicating since i use mojis and emoticons to express my feelings. "Free yourself from email, re-find your sense of humor." The free version limits how many messages you can access in your history, which will just show you how many messages you actually trade with your team. Fewer people are using Slack than should be -- it would be great if more teams adopted it. Try it for 30 days with part of your team, and evaluate how much faster and more efficient your communications are. Then add a few more team members. Try sharing files, trading screenshots, and planning a meeting. You'll see that there's clear benefit to using it. I took a small volunteer team that was on average taking 2-3 weeks to get to one clarifying question on a document, and took that same task down to 2 days. This volunteer team is distributed and we all have at least 1 full time job, and it was still SO MUCH EASIER to get back to one another. Communications are faster, more concise, and harder to miss with Slack. It's not as cumbersome and slow as email, and not as complex or specified as a full-fledged project management software. Team members are only nudged when they need to be, leading to more uninterrupted work time, but without leaving people hanging. "How did we ever work without it?" Slack streamlines communications, eliminates annoying endless email threads, and is a quicker and simpler alternative to both email and texting. It is also extremely easy to share files and has a world of options for integration with other platforms and services. You'll have to jump on eventually - this platform will take over every office and you don't want to be left behind. This has become the go-to communications platform for assigning tasks, following up project status, sharing files and even side discussions during online video calls. We also have used automated notifications from other platforms that feed in to our Slack channels. It has become essential for day to day communications and we wonder how we ever functioned without it. Being able to separate parts of the business into different channels means that you can ask questions or send messages to only the people who will be interested in that information. Especially at a company where employees work remote often, it's a great tool for keeping in contact at all times. As far as I can tell, I don't have any dislikes on slack. I think that our company uses it well. It's a really great platform for smaller and scaling businesses who are looking for ways to simplify inter-departmental communcation. Most of the platform is fairly customizeable with lots of apps that you can download for reminders, calendars, etc. It's also definitely a better form of communication within the company than email, with direct message features, and it's easy to keep on in the background of a desktop throughout the work day. I would highly recommend it to people who work remote often, so that they can stay in contact with the team. Overall, it's a great tool that I utilize for 99% of my work day and is extremely user friendly with lots of great features that you can add as you see fit. It's a great tool for reaching people quickly and for setting expectations on working remote. Knowing that you need to be online during business hours saves us from miscommunications and means that we can work from anywhere as long as we have access to the internet. That I can communicate with my co-workers in a reasonable time. Also I do not have to get up from my desk most of the time I can just slack my coworker if I have a question. I have found no dislikes yet with Slack. It has been very helpful for me in the work place. It is definitely a good tool to use in a work place. It is time efficient and get things done without getting out of your seat at your desk! Also allows you to make groups so you can talk to more than one coworker at a time. For example I had a patient on the phone and needed an answer quickly so I wrote in slack and someone responded right away and the problem was solved quickly. More time spent at our desk rather than getting up and walking over to someones desk. Then you start socializing and it takes away from time doing your work. So it definitely has been very helpful with time management. "Good choice for a software development team"
It is always good to have a message and file exchanging dashboard dedicated to a specific purpose, "software development" in case of us. Notification system which is integrated with many tools and frameworks makes it easy to trigger events and stay notified once there is something wrong with a part of the working system. While other messaging options are available, Slack would be a more specialized choice to be used in work environments. I would recommend it if you need a centralized panel for all your communications with other team members as well as members from other teams. Their API is very easy to implement and it is already ported into popular frameworks. Its notification system gives you the ability to be aware of different events triggered on your system. We use to collaborate between team members in our software development team. We have different channels for backend development, app development as well as product management and general purposes. Server-side errors and exceptions happening on production get logged into slack using their API so we get notified and track them instantly. 1.First of all i like the mobile application of slack and it is very user friendly. if i talk about the desktop application than there are many features which are exceptional and i really like to use. The list of features which i like is create channel (group), mention user, share documents and images, list of available smileys, search users, favorite items and many more. 2.Other thing i like is audio and video conferencing. so with the use of slack we can connect any of person who belongs to same workspace. 3.I have seen the channel details in right panel and it describe all the details of channel like the participated members, highlights, pinned items and many more useful information. The only thing that slack disappoint me for the channel notification preferences because when i create new channel by default the notification preference is set to "just mentions" so i will never know about new channel till manually check by clicking on that from the left panel. My suggestion for others is first do experience by your own. use slack for particular period of time and than choose it if you would like to use. We are using a single group (channel) for internal communication so the benefit is every one can share their ideas, the new things which they are learning, problems and some useful news so every one get to know that what is going on in organization and they can update their skill too. "The communication is more expedite with Slack"
I love Slack for office us between subjects and it allows for a much easier workflow. I love Slack, the personalization of channels and the additional privacy setting for conversations to be exclusive or open to a group is wonderful. There is no lag in messages that I have observed which is also awesome. What I do not like about Slack is adding people to the slack channel in mass groups is difficult and not very intuitive. Easy, quicker communication to streamline approach to interacting instant messaging/SMS feel of the product facilitates conversations quicker than an email - and is often a more helpful form of communication. It's a great tool! Slack was a great way for co-workers to communicate in-office and remotely. I like that you can create "groups chats" so you can update certain groups of people when collaborating on projects or other tasks. I also like many of the extra features, like gif integrations. "Easy and Quick Communication Between Team Members"
I like that I can leave the tab open all day and it updates in real time. The desktop notifications are helpful as well to help with prompt communication. The mobile app works great too! I use that while I'm on the go or can't be in the office for any reason. It allows for seamless and easy communication at all times. I really don't have many issues or dislikes with the app. The only "complaint" (which is inherent with using the web so it is no fault of Slack) is the download upload time. I guess the only real situation that I experience this is when I need to quickly send a photo to my computer to be able to email it to somebody. But really this is not a fault of Slack. Give it a try! You can break out your team into separate groups as well. We have split them into Marketing, Operations, and General. If there is a specific promo that we are planning and more members than the regular Marketing team are involved, we can add another group named specifically to that promo. It's easy to use and share files, photos, or other things. As with any data upload/download, there is a limit, so you may need to .zip a few files. We are solving internal business communications using Slack. This is extremely helpful for quick and efficient communication especially if something needs prompt attention. We haven't really used the video call chat feature, but I'm sure there might be a time when that is helpful to use. "Amazing software that adds a lot of smoothness for power users but ordinary people still using chat"
I've had problems joining new slacks sometimes, either it's because I've registered for it multiple times in different emails or something else. I think this occurred previously when I wanted to join a slack associated w/ a GT account (my school), which required using a GT email, but couldn't easily find a way to just integrate it to my current slack (I don't like having multiple sign-ins). Also, on larger teams, there's a lot of chatter. Though, if I explored the product more I suspect I would resolve this through some in-built option. Coordinating on co-development of complicated technical projects when not everyone is co-located. "Slack is a powerful tool for Company's communication"
- Slack integrates multiples third party services , many of them can be used with the free version as ( gitlab, Laravel-Forge). As much as 10 applications at the same time using free version. The user could known when this actions have been triggered because receive a notification from the robot. - Allow to receive and make calls for every user within a workspace with the free version and make calls for channels with the paid version. - You can switch between workspaces using the panel and is easy enough to get to know if you have notification in the other one. - If you have poor connection, is impossible to connect to slack. - Sometimes using Android devices the slack notification dissapear, unless you had beed tagged. If you want to have organizated all the conversations based on channels and users instead of conversation thread as others chats. If your company want to integrate with multiples third party services and want to know when the action have been triggered because receive a notification from the robot. "I like to have a chat shared with the whole team." I like that Slack has improved our communication by having everyone on the same chat system and that it works effectively and reliably. Slack has plugins more than any app on the field you can add zoom plugin bitbucket and more and more you don't need to open other apps to know updates all things in one place. The software does have some minor flaws: there are no settings for widgets in the chat, syntax highlighting and embedded video chat. However, this is more of a nagging, which for many are not problems at all. Corporate instant messenger, without which it is difficult to imagine life in the company. Communication within the team, with a couple of exceptions, occurs precisely for this service. Convenient, integrated with other software, it is possible to send files - some advantages. We started using Slack around two years ago, to improve our internal communications. We have it installed as an application on our computers, and on our smartphones. It works instantly and is very easy to use. It also has many features, and recently we have installed an SMS system so we can send text messages. I have had a positive experience with Slack. "Slack helps me every day, I love it!" Slack helps me communicate with my team every day. I am working with an in-house team, but we also have a remoter. This tool helps break any distance barriers and makes communication very easy. It can be a bit difficult to keep up with multiple conversations all at the same time. You can make separate channels, which helps, but it's still awkward and takes time to switch between them and try to keep track of it all. Other than that, it works great for what it's designed for! It's a nice feature that I didn't know I wanted, but, after using it for a while, I appreciate what it brings and will likely continue to use it as long as the value remains appropriate. Serves as a nice in-between of e-mails and instant messaging. For example, I used to get CC'd on e-mails that were about projects I wasn't involved with, and this allowed me to bypass that. Also, the record of conversation makes instructions and responses publicly visible in the same feed, which can help keep everyone on the same page. Cross-functionality with other apps is also nice. "A great alternative to Skype in business territory"
The way I organize conversations and groups through channels I love it because it is very similar to the old IRC chat I used to work a long time ago. I also like that it is possible to combine several communication options in the same tool, being able to use chat, video and audio calls. Slack channels can be managed by different people assigning permissions as necessary, these permissions can vary depending on the role of each moderator and we can even add automatic bots to perform moderation tasks or help through chat. Finally I also liked the possibility of connecting our Slack with other applications also useful and great help in the workplace such as Trello, Jira, Dropbox or also leisure applications that allow you to add Gifs to chat as Tenor. I have no complaints about Slack, the application is really wonderful and works well in the business environment, if I had to say something that can be improved on the application would be the web application, in my opinion, works much better and more fluid version of desk. Use the desktop version of the application if you plan to use the application professionally, in my opinion it is more stable and faster than the browser version, I would also recommend that you purchase the license of the application as it allows you to use the service without limitations. I am using Slack to communicate with the members of the development team in my work and it seems very useful because we can be in contact without moving from our job and sharing ideas while we work. I think it improves the organization of the teams considerably. "Communication and collaboration in the same team "
I like it because it is the ideal tool to work in a team, I can use it in any team, and even more, it allows the communication to advance for a timely and truthful decision making. There are many things that I like about this tool, I could name its low cost and therefore easy access to the cloud. Through this tool I manage to maintain a collaborative environment with my team since everyone can access the platform, it allows me to share important documents, communication through channels for project plans, I do not need to leave the tool to access other services , and the best thing is that the security measures in terms of access to the tool is very good because from good to first, it is not easy to review the information without going through this security channel. I do not like the tool not being able to make video calls as allowed by other platforms of the competition, it is necessary to correct this deficiency, so that the demand of such platform does not diminish, and thus be able to offer its customers an excellent service where the other platforms do not own it. I would recommend Slack with closed eyes, as a tool that allows me the effective communication for making decisions at the right time, makes my business produce the dividends that are required for it to stand on its own in real time. Is it affordable, affordable, and effective, what else can you ask for? Slack has been beneficial to me because it has allowed me to maintain contact in real time with my work group at a time when timely decision-making has been required and instantly, in the family environment allows me to be in contact with my children before any eventuality. I recommend it for being the most pertinent collaboration tool I have used in recent times. "An amazing solution for internal communication within our institution"
This softwareis impressive because it ensures that communication within our institution with clients and colleagues is made faster,effective and lively. It's easy to share files and documents with colleagues and clients with slack. High security is guaranteed because slack is highly encrypted to ensure privacy and safety of our institutions important information. The customers support is great and I recommend them 100% because we get instant feedbacks when in need. Slack is designed well to be very easy to use and the interface is clean and intuitive thus making it more user-friendly. It's the fastest instant messaging solution compared to its competitor. This software uses alot of bandwidth when uploading,downloading and sending large files and documents thus an excellent internet connectivity is required. I would urge other institutions to give it a trial Asap because its an amazing solution for internal communication. This software ensures that there is effective communication between our colleagues and customers this amazing collaboration during work. Solves the problem of internal communication be letting everyone to air their views in group chats or through sending of individual direct messages. "Very useful to be in contact with all the people in my team"
I love how easy and intuitive it is. The menu options are sleek and make it simple to improve your experience. LOVE that you can add custom emojis. So many integrations too. A few of the features are kind of hidden, so you have to go looking for them. Also, sometimes, my notifications don't work on mobile. Other than that, Slack is pretty good! Overall, I'm happy with Slack. I use it with a few of my clients and it gives me what I need. I can recommend it to others. Slack makes it easy to stay in touch with people in your organization/business. You can direct message individuals, start group channels, and even make calls. It's perfect when there's communication that doesn't really require an email and you'd really prefer an immediate response. You can set your status to away and even "snooze" notifications, so it's not like your phone/computer will always be blowing up. "Fantastic and easy to use"
It's really great that Slack can coordinate with the task platform that I use - Asana - and I can add tasks directly from there. I love the different channels so that I can easily communicate with my team, my supervisor, and my clients all in the same application. It has been a great platform to use and very user friendly. It's not easy to leave channels once I no longer use them. That's probably just me, but it would be nice if that was an easier thing to access. Definitely do your research to see how you can utilize all of the cool features for your company. There are plenty of shortcuts that will allow you to ease the number of tasks you accomplish in a day. Communications with team and clients. It's been great to be able to do everything in one place as far as conversations with people at work go. "Slack is the best internal communication software to have ever used." I like how it easy to share files,documents,pictures and videos with team members.Again this software is very secure platform to use that protecting privacy of our organization datas and important information.This software also allows effective and faster communication with team members enhancing great team collaboration.It's designed well to be very easy to use and has a clear user friendly interface.Likewise its the best fastest instant messaging software to have ever use thus making it gain more popularity.Finally it simple to create group chats thus easy to invite any team member to our workspace. It requires goods internet connectivity to conduct a high quality slack audio calls. The video calling features needs more advancement. This software integrates seamlessly with other tools that we uses in our organization thus effective collaboration and communication with team members and colleagues. "Everyone needs to use Slack. Period." I like that I can quickly chat with anyone in our organization whether it be formally or informally. It means I don't have to get lost in email chains or inundate people with email for small tasks. Also, it makes it easier to have a rapport with co-workers who are remote or not in the office often. I like the ability to use channels for various topics and for different departments. Plus the GIF integration is a must when you want to get your message across in a funny or relatable way. BONUS: Google Drive, Asana, HeyTaco! and Jira integrations make it easier to work efficiently and share tasks and accomplishments as they happen. PS: Do Not Disturb mode is a lifesaver when it comes to work-life balance. No complaints at all. I have been using Slack since early 2015 with zero headaches. For some people, Slack is a weird concept if they come from email or something like Salesforce Chatter but it's really great for collaborating and working with team members who might not be in the office with you. Communicating quickly with other team members. Spending less time in email chains. No more confusion or lost tasks in email chains. No need to text people when you can Slack people. Slack gives you a "DO NOT DISTURB" mode which is perfect for those of us who don't want to live on our phones. "CORPORATE COMMUNICATION WITH SLACK "
I like that I can hold conversations in an organized way (which for me is essential) through the channels, I use several channels, some for the work group and others to chat and distract me. Another thing that attracts me is that the work flows more from the option of integration of applications such as Dropbox, Google Drive, Asana, Jira, Polly allowing me to synchronize them without having to leave slack. I recommend using slack, when they start using it I recommend that they synchronize with other applications to optimize the work. It is very easy to use you can cover even the smallest details. The configuration is fully customizable, you can customize notifications, perform searches, more advanced options .. It also has a bot that guides you the moment you start using slack .. It is very beneficial, because of its versatility I can use it with clients, in a community or simply in some department of the company. Slack has allowed me to centralize the information, fast access from any other application with which it is synchronized and most importantly ... save time. Senior graphic designer, project manager. ""Great channel of communication and teamwork""
I like to be able to configure Slack to give improvements in the communication of my work group. - You can adapt Slack to manage different groups or departments in which the members share information without leaking to other channels. - Each work area is managed with absolute privacy. - You can load any type of document and format. - I like to share the designs, codes in the development of systems with our team of designers and developers to find more concrete solutions. - The integration with other applications such as Google Drive, Dropbox is a brilliant one. Since I use Slack, I have nothing against it. I would add options such as a history of content in the search engine and an expansion for the storage of content since it is very limited for access to users in the free plan. Initially our colleagues did not become familiar with the tool until they downloaded the desktop application and realized their ease when working and following each channel created by the organization, it is recommended its use and adaptation for any department. Is very complete. Slack has made a great leap to our department because it has made our team more integrated in each task, this increased productivity and efficiency when carrying out any project, we are in an area that can be carried out any discussion topic without problems, we have our integration of Google Drive with this tool and the behavior is absolutely profitable, we like it and it keeps us concentrating on the north that we consider to the development of any work. "An outstanding team collaboration and communication software." As a team leader,slack helps me to communicate and organize projects projects with my team members.This software is easy to download,install and start using without much needed training to my team members.It's easily accessible on mobile devices,computers etc thus making it more flexible tool to use.Likewise,this software integrates seamlessly with other software we uses in our organization like Google drive,Dropbox or Asana to meet much of our organization needs.Finally it easy to send instant messages among my team members that helping to keep them intouch during work projects. The only dislike I have with slack is that it has robust features like audio and video conferencing features that requires excellent internet connection thus without good internet this software would be difficult to access. I would recommend this software 100% to other organization in need of of a best team collaboration and communication software. This software enhances great team collaboration and communication among my team members thus bringing more productivity in every work projects. It's easy to share files and documents with team members. I love the fact that it's real time. You don't have to wait for the server to refresh to show you what's up. Also, it's designed to optimize working collaboratively, so it's very convenient when you have multiple people working in a similar project. It's so easy to share updates about a project, since it's more like a group chat. I love the fact that it has complete connectivity with other tools, like your calendar. It also works perfectly on your mobile phone! You get notifications and updates at the same time you would get them on the desktop app. It can be a little overwhelming at times. The channels feature is a good way to classify a bunch of projects or brands, but it would be so helpful if it included something like sub-channels. In my workplace, we have over 30 channels, one for each brand, but i'd love it if we were able to group all the channels that belong to the same client, each with its own group chat. Invest a little time to make sure everyone on your team knows properly how to use Slack. It's very easy to have a total mess if someone is unsure about how your company uses it. I come from a workplace where we used a different organization app, and it wasn't as efficient as Slack. We receive requests on a daily basis, and being able to get them so immediately is AMAZING! The ease of use is best. My team works in different cities, so having slack is a breeze when trying to communicate with my team. The file sharing option is quite lovely, and I like the fact you can add apps to your slack to fit your team's needs. I quite love the giphy app, when you want to send a little fun. The app is a really nice addition as well. Especially when you're in meetings and are away from your laptop, you can set where if you haven't been active on your laptop for 2-5 mins, slack will ping it to your app so you will get the notification there. There is really no dislikes for me. I'm even using the free version with my team, and there are zero problems. The most significant benefit is communicating with my team. No need to play phone tag or things get lost in texts, but emails are just too time-consuming compared to slack. Slack is excellent for team communications. The ability to create customized channels with specific users in each channel along with the ability to restrict channels to specific users is all great. It helps keep out team well organized when communicating with one another. The ability to search all of the archives is invaluable and the call/screen-sharing ability is incredibly useful. There are also numerous integrations as well as an API so you can add all kinds of customizations to your Slack team. There's not much to dislike with slack. Sometimes users who over-use the @channel and @here tags can get annoying, but you can customize your notifications to ignore those, and honestly, that's really more an issue with specific users than with the software. Slack keeps our team in communication when it matters: at the moment. We use Slack for most communication. We still use email and our task management software for communications that are appropriate, but Slack is where we communicate 70% of the time. We also use Slack to track deployments to production and even have a couple of clients as "guests" in our Slack team so we can quickly communicate with them if need be. "The perfect tool to communicate in a business environment"
The best thing about Slack is that it is a tool that solves communication problems in business thanks to the fact that it is possible to maintain contact with the whole team and the best at any time is possible to leave messages even if the receiver is not available because the message can be read and answered later. It is also very useful because it is possible to keep a log of everything that has been written in the chat in case you need to find some useful information that you forgot. It also has a very useful utility and is that it is possible to install an automatic response program (a bot) which is a great help to answer the most common questions. The Bot can also do maintenance tasks and administration of the chat, being able to block certain words and content as images. Although Slack is very popular in the business world it is not so much in the personal field and I think that this is because its interface is too serious due to its dark tones, I think if it were possible to change the interface for something more similar to discord it would have more success. To have the full experience of Slack I recommend you make use of the monthly license as it allows you to use the application without limitations, before you start using the application I suggest you configure everything according to your needs and preferences also making use of the applications external because they are very useful. Using Slack I can be in contact in a simple way with the members of my team with which I do web projects, can share files or screenshots and even source code that is formatted correctly by Slack (using a plugin). I can also contact my colleagues quickly through audio or video calls to solve problems with a more personal contact. What I like most about Slack is that it helps a lot in the communication between members of my team, especially in the chat we can discuss freely and calmly about the problems or improvements to be made in the projects, personally I prefer this way of communication about the video or audio calls because it allows you to meditate and respond in a more detailed way to each person. Slack technically works well, especially the desktop version is very light and has a low resource consumption, I have not found any bug and the fluidity of the operation is correct without any kind of glitch or delay in animations. I would also highlight the possibility of configuring automatic bots to manage channels or provide important information on a regular basis in the chat so it does not fall into oblivion. What I do not like about Slack refers to its web version, which I consider to be more limited with respect to the desktop version, especially in terms of performance and fluency, and visually I think it is inferior and it is not possible to modify the theme, which if possible in the desktop version. Before proceeding to use Slack prepares the application for the purpose it will meet, creates channels, grants permissions, changes themes and everything you need to adapt Slack to your work environment in this way it will be much more useful and comfortable to work using the application. Using this service I can eliminate communication barriers that exist between people who are part of the same team but who work in different places, using Slack we can share experiences and opinions in a more direct way either through chat or video, ultimately improving the organization and speed when developing projects. 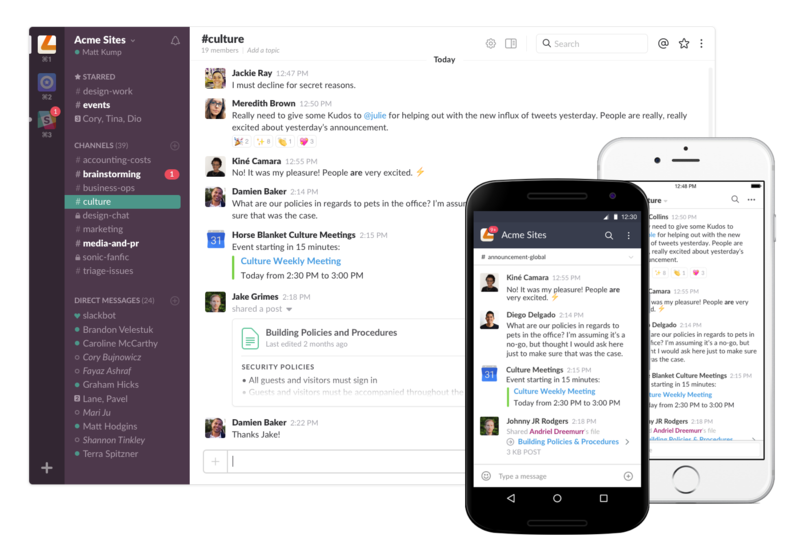 Best explained as the best way to communicate within teams, Slack is absolutely amazing. It has a lot of integrations and at the same time allows for meme-worthy conversations and the channels are great! It is very easy and intuitive to use. Simple things like message reactions, custom animated emojis, gifs might not seem as the most important thing to have in a team, but spend 15 minutes looking for the perfect gif for the conversation and it will prove you otherwise - it is super important. The only issue that one might have with Slack is the fact that while you can add people to a group conversation, you cannot add anyone else to that conversation. Adding a name would immediately open up a new chat without all of the messaging history and files, basically a start from scratch. It's a great way for people to communicate with each other, especially when it comes to a company with multiple offices. It allows for easy new member introduction and onboarding. Super simple and intuitive to use. "Using Slack for multi-site communication and workflow"
The best features of Slack are ease of use, the ability to place users in various channels to keep people and functions organized, and the ability to expand the functionality with add-ons like Workast, for example. Further, it's not a cost-prohibitive software for the utility it provides. The one thing that I wish the Slack could improve on would be the cluttered look...it can be a little daunting to find your way through a conversation until you get used to the flow of it. Slack is definitely an easy start-up, has fantastic integration capabilities with many of the ancillary products we use, and has a very straight-forward user interface. Slack allows us to communicate directly with our partner agencies and quickly answer questions and solve problems that may arise. The biggest benefit for our company is that these type communications do not get buried in e-mail, and the ability to have multiple people viewing the conversation means that things don't get buried in e-mail, and allow everyone on the team to follow the entire thread of conversation from the beginning. "Good free option for non-profits"
We use it combined wZOOM for video conferencing - wish it had a notifications feature - maybe it does and I don't know how to use it? Slack is great for keeping your email's inbox free and clear of smaller conversational things that don't need to be in your email! It's great for teams in different places to be able to communicate with ease. We use different channels for simple communication about specific teams/problems/or areas of work. I also really love some of the silly features, like being able to create your own emoji within the app and using emoji responses as a whole. They've done a great job with add-on features like integrating Asana, Giphy, or Google Drive. Slack can easily turn into a group text message that you don't want to be a part of, unfortunately. However, I will say that if you use Slack's features of controlling what times or days you get notifications, it can be controlled. It's just that not everyone knows how to set up their Slack that way. Using the free version is great, however, it will not store previous Slacks (messages) forever so that is something you have to deal with and keep in mind if going the free route. So, it is good for day to day conversation but should not be somewhere that you store information to refer back to later. Mostly just keeping our inboxes cleaner! "Love to Use with Team"
Sometimes I run into an issue where I'm unable to hear audio when I call a team members and have to go to other resources. Slack is a user friendly tool. It is an extreme delight to use amongst colleagues both in house and remotely logging in. It makes it easy to communicate with the team in LA along with our support team in Ohio. You can create channels/groups based on department and can still reach out to someone directly via your own private chat with that person. I highly suggest using this with your company if you aren't. The feature that allows you to directly integrate certain programs is great as it will give you notifications for these via slack as well so you do not have to go to screen/page to check. Being able to communicate urgent matters to the entire team without having to conduct an email, being able to create multiple channels for each department and only add relevant team members. so we can make sure that only the people who really need to get the message can see it. "Great way to communicate with teams"
This tool is easy to use and understand. You can use it with other tools like Dropbox or Google Docs. It's customizable and nicely aesthetic. You have multiple communication channels, so you can talk with the whole team, a small part of the team, or individuals. Those channels can be public - so they can be searched, or private so only the people in those channels even know they exist. You can share images and videos, use emojis to react, and, perhaps best of all, edit your comments to correct a typo or to clarify it. Team members can set "do not disturb" times so that the notifications don't go off, in case of sleep or important meeting or the like. This is a great communication tool for teams. The main drawback to Slack is if you try to use it for multiple different groups. I have one business that actively decided not to use Slack for their comms because everyone already had at least one slack group already and it's too inconvenient to switch between groups. Slack will only notify you of messages for the group you have active at the time, so you may miss important communications from another group.